The EPPP, developed by the Association of State and Provincial Psychology Boards, is a test used by Canadian provinces and US states to certify the knowledge and integrity of professionals providing psychological services in their area. Doctoral or master’s level candidates or degree holders take the EPPP to obtain a certificate of professional practice in Canada or the USA. The EPPP is a computerized assessment prepared by the American Psychological Association (APA) and offered to registered candidates at Pearson VUE testing centers. Candidates initiate the testing process by applying to the licensing authority in their state or province, which contacts the EPPP for scheduling. 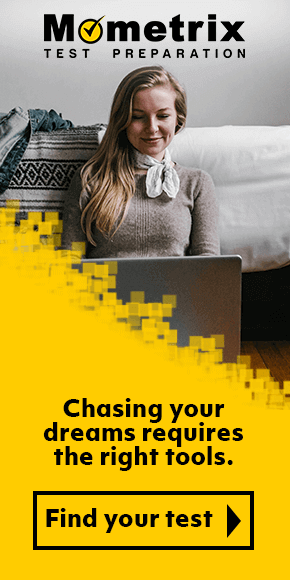 There is a $600 application and an $87.50 scheduling fee, payable to Pearson VUE, to take the exam within 90 days of registration. These fees are nonrefundable to candidates who are no-shows or who wish to reschedule their test within the final month of the 90-day testing window. Test takers should arrive at the Pearson VUE site well before their exam begins for an orientation on the testing software. A photo ID is the only personal item candidates may take into the testing center. Test center staff may supply a whiteboard or pencil and paper to facilitate note taking during the exam. Pearson VUE makes arrangements for test takers with documented disabilities. These include separate testing rooms, additional testing time, and the provision of a reader or recorder. A French language version of the exam is offered to those seeking licensure in areas that require that a French version of be available. How is the test organized? 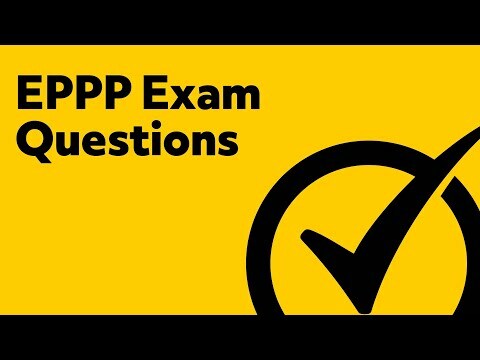 The EPPP consists of 225 multiple choice questions to be completed in a testing period of four and a quarter hours. In order to achieve an ASPPB-approved passing score of 500 or above, the test taker must answer 70% of the questions. Individual states and provinces may establish additional scoring requirements for licenses in their jurisdictions. Candidates whose scores fall below the requirements of their licensing boards may repeat the application process to retake the EPPP. What does the EPPP cover? There are eight sections of the EPPP. These content areas address the biological, cognitive-affective, and social-cultural bases of behavior; growth and development; diagnosis and assessment; treatment and supervision; statistics and research methods; and professional ethics and legal issues. What are the best ways to prepare for the EPPP? Even candidates who have excelled in their graduate studies may falter when it comes to taking a licensure exam. Test experts advise that candidates review key concepts and take practice tests that adhere as closely as possible to the questions on the actual exam. Mometrix offers study materials proven to focus study and increase the odds of success on the EPPP. The Mometrix EPPP Flashcards provides a thorough, convenient review of content terminology, definitions, and domain associations. Mometrix Flashcards move with the candidate throughout their day from the parking lot to the office, lunch room, or library with handy reminders of possible EPPP questions on drugs (Acetylcholine, Antipsychotics, Benzodiazepines), theorists (Beck, Brocha, Piaget, Skinner), personality disorders, brain imaging techniques, sleep and memory disruptions, statistical validity, and ethics for practitioners. Written by experts in test design, the Mometrix EPPP Secrets Study Guide gives exam candidates hours of practice answering questions like those on the EPPP, as well as tactical advice to help test takers read questions carefully before rushing to select an incorrect answer. A Quick Reference Guide organizes and condenses the eight domains of the EPPP to boost recall of facts. Practice tests hone the candidate’s reasoning skills, minimize time spent on elaborate calculations to survey the wording of questions and make intelligent guesses. Practice exams are followed with detailed explanations of the answers so that on the exam day, test takers will know how to select the correct responses and experience the pleasure of a high marks on the EPPP and a career as a licensed practitioner. Mometrix Academy is a completely free EPPP study material resource provided by Mometrix Test Preparation. If you find benefit from our efforts here, check out our premium quality EPPP study guide to take your studying to the next level. Just click the study guide link below. Your purchase also helps us make even more great, free content for test-takers. Our customers love the tutorial videos from Mometrix Academy that we have incorporated into our EPPP study guide. 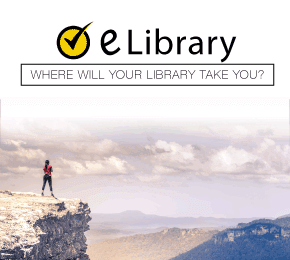 The EPPP study guide reviews below are examples of customer experiences. I found this EEEP guide to contain condensed information that enabled me to study material that pertained only to the exam. This guide reduced stress, not having to re-read volumes of text to study. It is an easy study book. Simple and go to what is essential. It helps with strategies in order to have a better result with the tests. This material is definitely helpful in narrowing down what is essentially to study. I appreciate the concise yet valuable information provided. The information provided in the study guide is very helpful and I would recommend to others who are preparing for this exam. I really like this resource because it has the information very well organized and accurate. After so many years of studies, it is good to have the information condensed in one place. Also, it’s good to have the practice test to see my progress. I have started to read through your study guide and feel that it more closely resembles the format and organization of the actual exam, in fact, closer to any other study materials I have purchased in the past. I really enjoy the material because it is straight to the point, little fluff, however, quite comprehensive. I also enjoy that the material allows me the opportunity to provide me interesting topics that motivate me to do my own private research oh the topics, preparing me even more for my BIG test day. This book seems to be well structured. It goes over each domain that the EPPP tests for and the questions are also a nice addition. Overall, it’s pretty sufficient and extremely helpful. I like that it includes all sections from the EPPP in condensed form. It seems to touch on the most important information needed to know for the test. I also like that it has a practice test. Thank you for this great study guide. 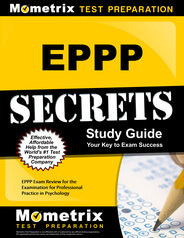 Learn more about the Mometrix EPPP Secrets Study Guide. Learn more about the Mometrix EPPP Flashcards.